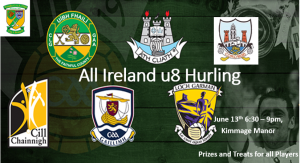 Our under 8s are competing in their first “All Ireland” Hurling Blitz running from 6:30 – 9pm on Wed June 13th in Kimmage Manor, all are welcome to come along and support. We will have them all buzzing across 6 teams, Offaly, Cork, Kilkenny, Dublin, Galway and Wexford. With the great fine weather we are having it would be great to get down and support them.